Newly elected Washington County Judge-Executive Tim Graves, right, is congratulated by former Washington County Circuit Court Clerk George Graves following the reading of Tuesday's election results. There was no doubt Washington County would have a new judge-executive following Tuesday’s election. The only thing in doubt was who would claim the position. In a tight race, separated by only 172 votes, Democrat Timothy Graves defeated Republican Tony Royalty 2,621 to 2,449. Another interesting race for local voters was that for Washington County sheriff. 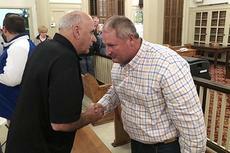 Incumbent Jerry Pinkston, a Democrat, faced Republican challenger Joe Carpenter. Pinkston held on to his seat by 93 votes, defeating Carpenter 2,586 to 2,493. The win will set Pinkston up to begin his second term starting in January. Jailer Joe T. Mudd, a Republican, defeated Democratic challenger Michael Smith. Mudd won by a count of 2,965 to 2,047. Mudd was appointed to the position in August 2017 following the retirement of longtime jailer Steve Hardin. Following the retirement of longtime Washington County Clerk Glenn Black, two candidates were in the hunt for the office. Teresa Culver Marrinan, a Democrat, defeated Republican Coy R. Howard by a count of 3,027 to 2,022. Washington County Attorney Bill Robinson, a Democrat, easily won re-election, defeating Republican William “Bill” Bausch, 3,653 to 1,294. Lebanon attorney Jude A. Hagan battled Campbellsville’s Mike Hall Jr. to serve as 11th Judicial District Judge, serving Washington, Green, Marion and Taylor counties. Hagan came out on top in Washington County by a count of 2,458 to 1,581. Hagan also won in Marion County by a count of 4,361 to 1,431. Despite winning those two counties, Hagan fell in Taylor and Green counties to seale the deal for Hall, who won Green County by a count of 1,987 to Hagan’s 1,740 votes. The real decision-maker came in Taylor County, where Hall won by a count of 6,537 to 2,379 to seal the race and make Hall the overall winner. Several seats on the Washington County Fiscal Court were up for election, and there will be some new faces on the court in 2019. In District 1, Republican incumbent Terry Tingle faced Democratic challenger Karen Wheatley Mudd. Tingle won the race by a count of 511 to 302 to retain his seat. District 2 saw Democratic incumbent Benjamin Settles face Republican challenger Steve Devine. Devine won by a narrow margin, claiming the seat with a vote total of 524 to Settles’ 438. In District 3, longtime magistrate Hal B. Goode decided to not seek office again. That left Republican Bobby L. Russell and Democrat Mark Wilkerson to vie for the seat. Russell came out on top, 461 to 219. Districts 4 and 5 saw two candidates who had no opposition in Tuesday’s general election. Stan K. “Kenny” Hardin, a Republican, will represent District 4. He defeated incumbent Johnny Coyle by just 8 votes in the primary to claim the seat. In District 5, John H. Graves will be the new magistrate. Graves won the Democratic primary, defeating seven other candidates in the process. In District 6, Paul E. Lewis, a Repubican, faced Democrat Phillip L. Carrico, where Carrico won 729 to 315. Three constables will serve, and none had an opponent in the general election. Those serving will be Stephen Pater in District 3, David Donathan in District 5, and Jim Crouch in District 6. District 1, 2, and 4 had no candidate file. Republican Len Benedict was unopposed in the race for Washington County coroner. No candidate filed to run for the office of county surveyor. On the Washington County Board of Education, a non-partisan position, Curtis Hamilton will represent District 1, while Jeremy Thompson will represent District 2. Neither candidate had opposition, and no other board seats were up for election. Three local cities had races, with Springfield Mayor Debbie Wakefield facing no challengers. She will retain her seat and serve a second term. Springfield City Council is made up of six members, and there were eight people in search of those seats. The six who will serve and their vote total are Chuck Polin (702), Carolyn Hardin (660), John “Willie” Ellery (655), Brooke Murphy Coulter (634), Lisa Jones Haydon (589), and Chris Essex (560). In Mackville, Carl Gabhart will retain the seat of mayor, while Nathan Cochran, Heather Reynolds, Billy Cloyd and Linda Anderson will serve as city commissioners. Willisburg saw a two-person race for its mayor’s office, with Wanda K. Thompson facing Myron Byrd. Thompson won the race 110 to 34. Willisburg has four seats for city commissioners, but only two filed for election, and they were Ricky M. Settles and Rea Byrd. Washington County is served in the 22nd Senatorial District by Republican incumbent Sen. Tom Buford, who faced Democratic challenger Carolyn DuPont. Locally, Buford won the race by a count of 2,804 to 2,009, but results from other counties served by the office were not available at press time. Senate District 22 is made up of Washington, Garrard, Jessamine, Mercer counties, as well as a portion of Fayette County. As a member of the 55th Representative District, Washington County is served by incumbent Republican Kim King, who faced Democratic challenger Cathy Carter. King won locally, 3,212 votes to 1,698. House District 55 also features Mercer County and a portion of Jessamine County. Results from those counties were not available as of press time. Incumbent U.S. Representative James R. Comer, a Republican in the 1st Congressional District, faced Democratic challenger Paul Walker. Locally, Comer collected 128 votes to Walker’s 69. In Washington County, the 1st Congressional District only consists of the Pottsville precinct. The rest of Washington County is represented by incumbent U.S. Representative Brett Guthrie, a Republican. Guthrie locally collected 3,076 votes to defeat Democratic candidate Hank Linderman (1,411) and Independent candidate Thomas A. Loecken (105). Complete results from the rest of the Congressional districts were not available as of press time. In the 3rd Supreme Court District, Debra Hembree Lambert and Dan Ballou faced off for that seat. Locally, Lambert defeated Ballou by a count of 2,665 to 738. Results from the rest of the district were not available at press time. 11th Judicial District Judge, 1st Division, was a race that featured incumbent Amy Sullivan Anderson, who had no challenger. A constitutional amendment on the ballot for victims’ rights known as Marsy’s Law received 2,561 votes of Yes, compared to 1,864 votes of No in Washington County. Because of a ruling by a Franklin Circuit judge, the results of the “Marsy’s Law” question will not be certified at this time. Last week, an attorney representing “Marsy’s Law” advocates said supporters are petitioning the state Supreme Court to take up the dispute. Statewide totals were not available as of press time.